Bed Frame and Mattress Deals. 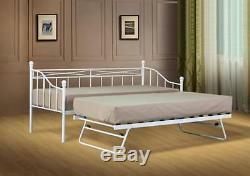 White Paris Metal Daybed, guest bed with or without trundle, mattress option. Presenting the Paris Metal Daybed from Cloud Nine Furniture's exceptional value range. From our selection of daybeds, the Paris has a sleek, simplistic design that comes in a white finish with a sturdy metal frame which is suitable for any bedroom design theme. We also offer the trundle option, finished in a classic white or black in the 3ft ONLY with a sturdy metal construction. The bed is available in both a 2ft6 and 3ft, with or without mattresses. &###xA0;The trundle with a mattress beneath the bed can be pulled out and meets the height of the bed frame. Choose from variations above in the drop down menu. Available in 2ft6 small single and 3ft standard single. Available With pull out trundle or Without pull out trundle. Also available with an option for one or two mattresses. (Please check your mattress options before checking out). If you have your own mattress the maximum depth the trundle takes is 18cm deep. This bed comes flat packed for simple home assembly, all tools and instructions included. This will not affect the quality of the product. To ensure your new furniture is suitable for your home, please remember to measure your available space before ordering. 2ft6 Paris Day bed (H x W x L) 95cm x 85cm x 201cm Approx. 3ft Paris Day bed (H x W x L) 115cm x 100cm x 201cm Approx. PLEASE BE ADVISED THAT ALL DIMENSIONS ARE APPROXIMATE, PLEASE ALLOW ROOM FOR SLIGHT VARIATIONS. 13.5 gauge open coil spring system. Quilted cover to hold upholstery fillings in place. Basic Budget Lucy Mattress Specifications. 13.5 Gauge Open Coil Spring System. Luxury Feel Damask Micro Quilted Cover. Mattress Depth 17 cm (Extra Comfort Fillings). Sleep Both Sides - Turn When Required. Over the past few years we have been developing our range of products to enable us to supply consumers with furniture at the absolutely lowest prices possible. We do not have the large overheads that shops and large retail chains have so we can keep our prices low and pass all the savings onto our customers. Cloud Nine Furniture prides itself on its excellent prices and customer service. We invite you to look at our products and pricing and compare them with any other website or shop. We don't believe that you will find a better deal anywhere else which is why we are not able to offer discounts on multiple items. We only deliver to the UK. Unfortunately we are UNABLE to give more specific time slots. We are unable to compensate for delayed deliveries. We can only accept products for return with their original packaging in the condition they were delivered. This does not apply to products which are faulty - these will be collected/replaced free of charge. The more info you supply us with the quicker we will be able to rectify the issue. Please however beware of the following. Mattresses, Chair Beds and Beds. As with nearly all mattress retailers we are unable to accept "used" mattresses for return for health and hygiene reasons. By "used" we mean mattresses that have been removed from their original packaging. Flat packed furniture As with nearly all furniture retailers we are unable to accept flat packed furniture that has been erected or semi-erected. Please Note: Unwanted orders will be collected subject to a &###xC2;&###xA3;15-&###xC2;&###xA3;30 charge depending on your order (to cover the carrier's charges), this does not apply to products which are faulty - these will be collected/replaced free of charge. We will then be able to assist you in either sending replacement parts or a new product. This listing is currently undergoing maintenance, we apologise for any inconvenience caused. The item "White or Black Paris Metal Daybed, guest bed with trundle mattress option" is in sale since Thursday, February 20, 2014. This item is in the category "Home, Furniture & DIY\Furniture\Beds & Mattresses\Bed Frames & Divan Bases". The seller is "cloud_nine_furniture" and is located in Bridgwater. This item can be shipped to United Kingdom.